A man stands behind a picture of Alfred Olango during a protest Wednesday, Sept. 28, 2016, in El Cajon, Calif. 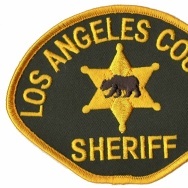 Dozens of demonstrators on Wednesday protested the killing of Olango, shot by an officer after authorities said he pulled an object from a pocket, pointed it and assumed a "shooting stance." 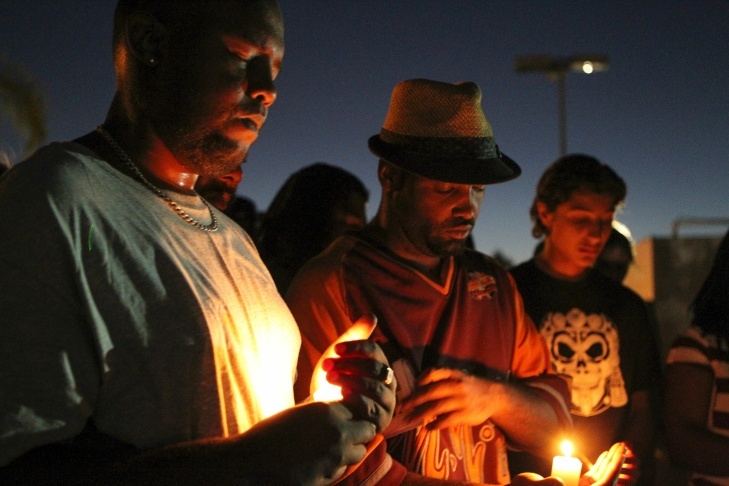 Mourners and activists hold a candle light vigil during a rally in El Cajon, a suburb of San Diego, California on September 28, 2016, in protest of the police shooting the night before. Protesters marched in a California town following the fatal police shooting of an unarmed black man said to be mentally ill, as local officials urged calm and pledged a full investigation. The victim, identified as Ugandan refugee Alfred Olango, 30, was shot on Tuesday in the San Diego suburb of El Cajon after police received an emergency call about a man behaving erratically and walking in traffic. 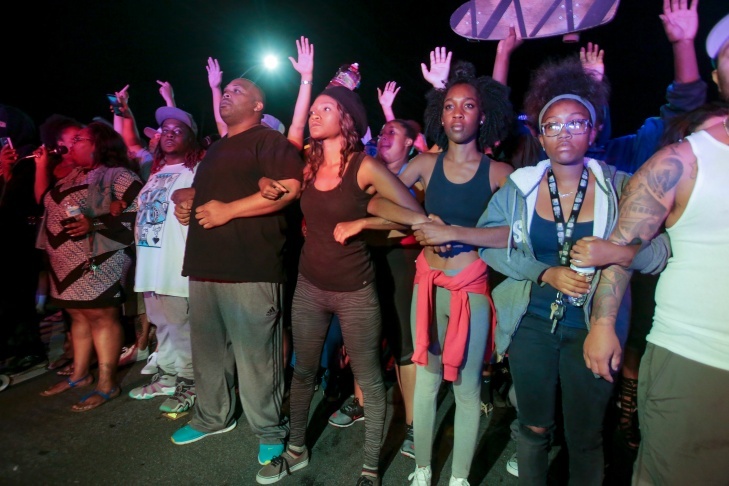 Protesters lock arms in front of a police line in El Cajon, a suburb of San Diego, California on September 28, 2016, in response to a police shooting the night before of Ugandan refugee Alfred Olango. Protesters marched in a California town following the fatal police shooting of an unarmed black man said to be mentally ill, as local officials urged calm and pledged a full investigation. 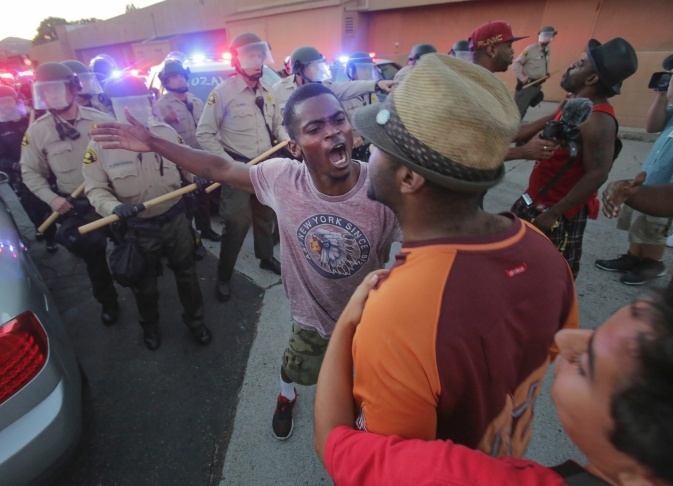 Protesters face off with police in El Cajon, a suburb of San Diego, California on September 28, 2016, in response to a police shooting the night before of Ugandan refugee Alfred Olango. Protesters marched in a California town following the fatal police shooting of an unarmed black man said to be mentally ill, as local officials urged calm and pledged a full investigation. 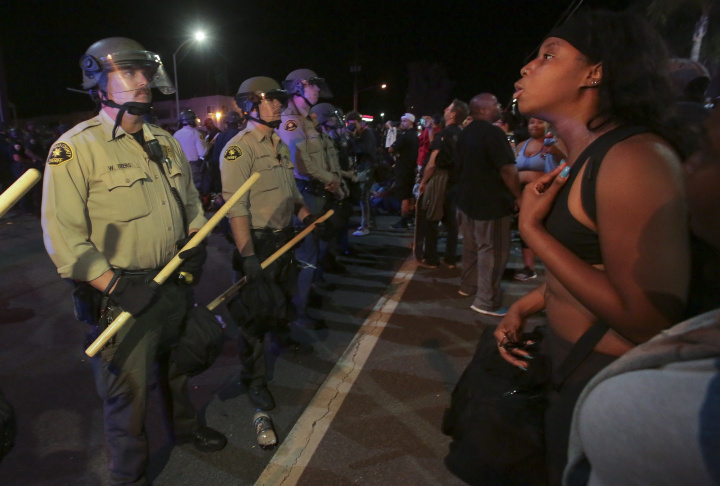 Protesters face off with police, as others try to block them during a rally in El Cajon, a suburb of San Diego, California on September 28, 2016, in response to the police shooting the night before. Protesters marched in a California town following the fatal police shooting of an unarmed black man said to be mentally ill, as local officials urged calm and pledged a full investigation. The victim, identified as Ugandan refugee Alfred Olango, 30, was shot on Tuesday in the San Diego suburb of El Cajon after police received an emergency call about a man behaving erratically and walking in traffic. 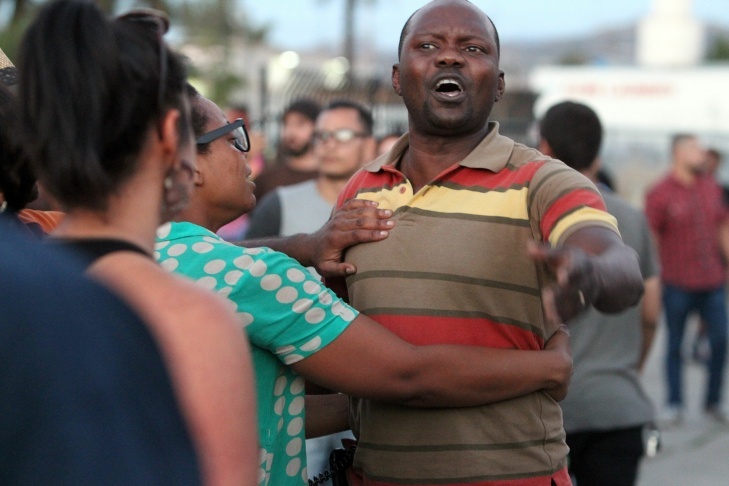 A man claiming to be Alfred Olango's cousin shouts at police during a rally in El Cajon, a suburb of San Diego, California on September 28, 2016, in response to the police shooting of Olango the night before. Protesters marched in a California town following the fatal police shooting of an unarmed black man said to be mentally ill, as local officials urged calm and pledged a full investigation. The victim, identified as Ugandan refugee Alfred Olango, 30, was shot on Tuesday in the San Diego suburb of El Cajon after police received an emergency call about a man behaving erratically and walking in traffic. A man carries a sign during a protest in El Cajon, a suburb of San Diego, California on September 28, 2016, in response to the police shooting the night before. Protesters marched in a California town following the fatal police shooting of an unarmed black man said to be mentally ill, as local officials urged calm and pledged a full investigation. The victim, identified as Ugandan refugee Alfred Olango, 30, was shot on Tuesday in the San Diego suburb of El Cajon after police received an emergency call about a man behaving erratically and walking in traffic. 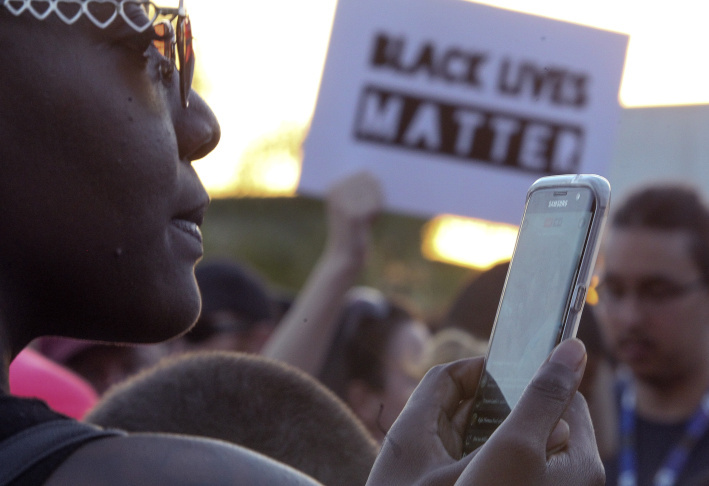 A woman films a protest in El Cajon, a suburb of San Diego, California on September 28, 2016, in response to the police shooting the night before. Protesters marched in a California town following the fatal police shooting of an unarmed black man said to be mentally ill, as local officials urged calm and pledged a full investigation. The victim, identified as Ugandan refugee Alfred Olango, 30, was shot on Tuesday in the San Diego suburb of El Cajon after police received an emergency call about a man behaving erratically and walking in traffic. 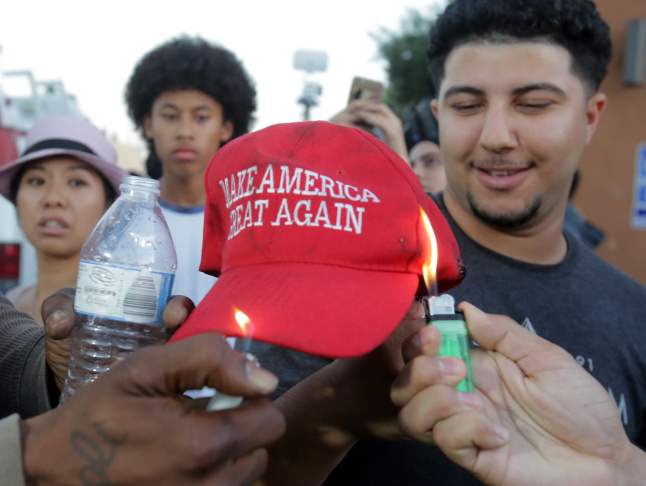 Protesters burn a hat during a rally in El Cajon, a suburb of San Diego, California on September 28, 2016, in response to the police shooting the night before. Protesters marched in a California town following the fatal police shooting of an unarmed black man said to be mentally ill, as local officials urged calm and pledged a full investigation. The victim, identified as Ugandan refugee Alfred Olango, 30, was shot on Tuesday in the San Diego suburb of El Cajon after police received an emergency call about a man behaving erratically and walking in traffic. 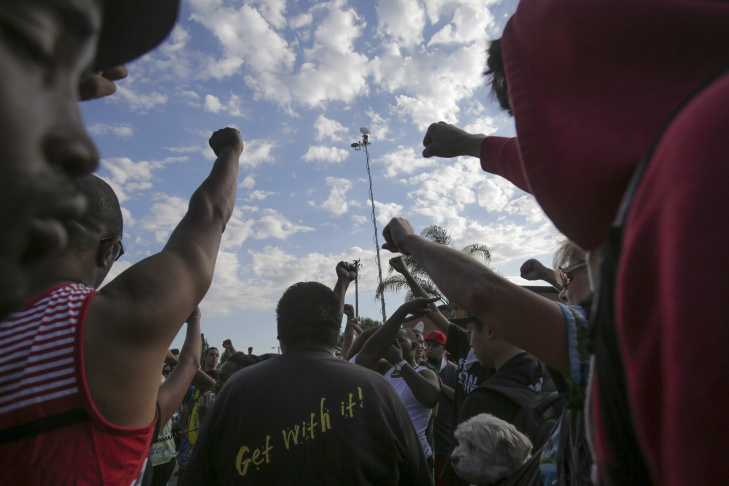 Demonstrators raise their fists during a rally in El Cajon, a suburb of San Diego, California on September 28, 2016, in protest of the police shooting the night before. 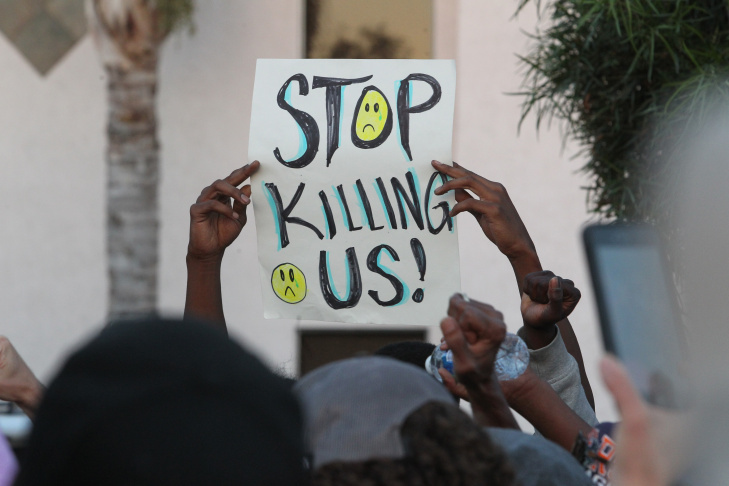 Protesters marched in a California town following the fatal police shooting of an unarmed black man said to be mentally ill, as local officials urged calm and pledged a full investigation. 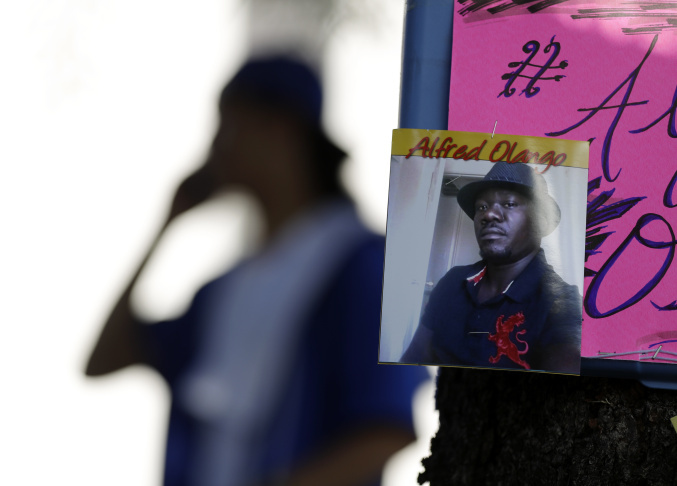 The victim, identified as Ugandan refugee Alfred Olango, 30, was shot on Tuesday in the San Diego suburb of El Cajon after police received an emergency call about a man behaving erratically and walking in traffic. It took more than an hour for police to arrive at the shopping center in a San Diego suburb where a distressed black man had been wandering into traffic. It took about a minute for him to be shot and killed. 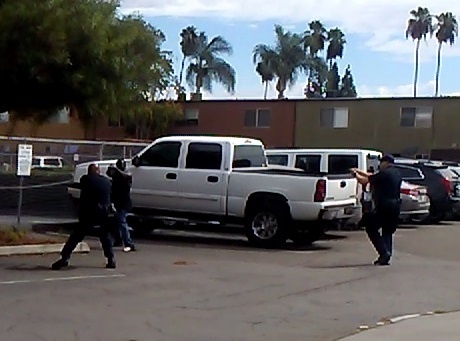 Alfred Olango pulled a large electronic cigarette, known as a vape pen, from his pocket and pointed at the police officer who fired, while a second officer stood nearby trying to subdue him with a stun gun, El Cajon police said. The details emerged Wednesday in the shooting of Olango, who was having an emotional breakdown over the recent death of his best friend, an attorney said. The investigation centered on a video of Tuesday's shooting taken by a bystander. Police have produced a single frame from the cellphone video to support their account, saying it shows Olango in a "shooting stance." Olango, 38, arrived in the U.S. years ago as a refugee from Uganda. 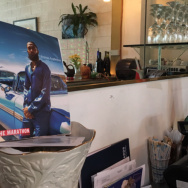 Since then he ran afoul of the law several times: selling cocaine, driving drunk, and illegally possessing a 9mm semi-automatic handgun when he was arrested in Colorado in 2005 with pot and ecstasy in his car, according to court records. 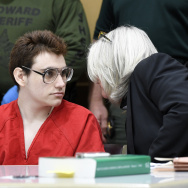 He pleaded guilty in federal court and was sentenced to nearly four years for being a felon in possession of a gun.